A few things about GE and Revere chiming clocks that you should know. First, all of these clocks are fitted with a Telechron manufactured movement. Beside the unusual and unique versions - dual chiming, auxillary movements, Grandfather and other tall case clocks- there are two basic movements -- Movements made pre 1933 and movements made post 1933 and through the sixities. This means that at a minimum, your clock is 50 years old and in fact, can be 80 plus years old. 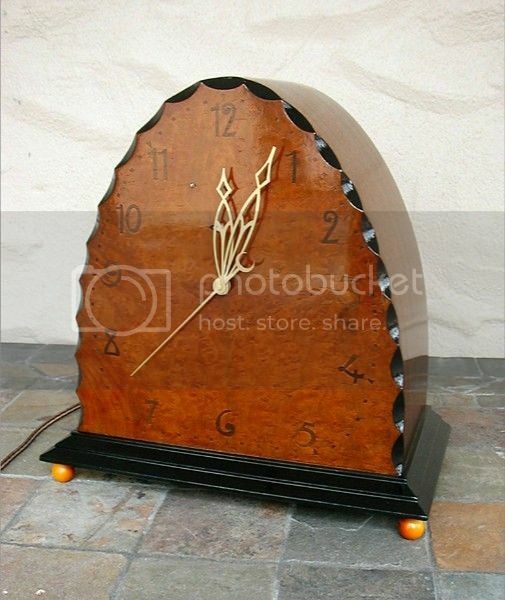 The majoritiy of the clocks we work on were made in the 1930s and 1940s, making them an average of 75 years old. 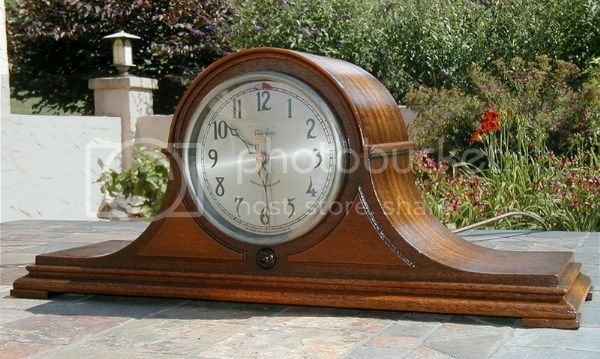 This tells us two things - Telechron made a fine product to last this long and your clock is old and needs some TLC! It is a precision mechanical piece of equipment that has numerous moving parts including gears, springs, washers, plus striking hammers, chime rods, an electric field coil and a sealed rotor to drive it all. You will have to learn a few things about your clock to keep it running the way it should. We provide both written and video instructions on many areas of operation and adjustment. We can clean and oil it, repair or replace broken parts and refinish the wooden case. We can rebuild your rotor, supply new glass, repair broken case parts, supply missing parts, and basically rebuild and restore your treasure. But you should have a basic knowledge of how it works and what to look for when something just doesn't work right. We are here to guide you and offer email and phone support when a problem arises, because it can get costly if you have to send it in to us to reset the time or make a hammer adjustment. *Includes all General Electric, Revere, & Telechron Motored Herschede Chiming Clocks (excluding the Electrically Wound Movements). Please Note: We are no longer accepting Grandfather, Grandmother, or other Tall clock movements for service work. We are just not set up to service these movements. Also there are certain older movements that we are not set up to work on. There are not many of them, but we will let you know if you have one. And finally the '6' Series Telechron Strike only and Ship's Bell Clocks have an inherent design flaw that cannot be fixed, and we will no longer work on them. You can learn more about those clocks in the eBay Guide we published about them... HERE. Because we are one of the few companies that does repair work on Telechron Motored clocks, and the high volume of requests for repair services, we have set up a Waiting List for repairs on Chiming clocks. Once you have contacted us with your desire to have service work done on your clock, your name will be placed on our waiting list and you will be given a number indicating your position on the list. As we get close to your name we will contact you giving you the information you will need to send your clock in. Please do do not send any Chiming clocks in without prior approval. Please Note: As we move through our list we often get emails return as undeliverable because you have obtained a different email than we originally had. We will try to call if we have a phone number but many times we can't contact you and must move on. Please, if you see that we are on a number that is past your number and you were not notified, email us with you new contact info and we will work you in as soon as possible. The counter below lists the number of people who are on the list, and the number of the next clock to be called in. I will update this counter at least once a month, if not more often. We work on several clocks at one time, so the numbers may jump by a few at any given time. If the counter shows that number 30 is up next, and your number is 50, it means that there are twenty clocks* before you to be serviced. If you are not on the list and the counter shows number 50 up next and the number of names on the list is 105, you will be placed on the list at number 106 with 55 clocks* before you. We keep trying to reduce the waiting time but new clocks are being added almost weekly to the list. Please realize that each clock takes time for us check it out, find the problems, and then do the work. The process can not be rushed and we would rather take the proper time to service and test your clock and not run a "repair mill". Wait times can be long but be assured that each clock is given our thorough attention to detail and expert workmanship. And once we have your clock, the service time is typically 3-4 weeks. To Be Placed On The Waiting List: email us via our Contact Us page indicating your desire to be placed on our waiting list. Include your name, email contact address, phone number, the model of the clock (ie R-913, GE-416, etc), whether you want Total Restoration or movement and rotor work only (no case work). If you do not have access to the Internet you may phone in your information (Contact Us page). Since wait times can be long make sure you advise us of any changes in email or phone number while on the Waiting List. *these numbers may vary beause of "no shows" when contacted, or not wanting the clock serviced anymore. Please Note: When changing computers I got off our Waiting List Number by about one hundred. No One has been lost. just adjust your number by adding about 100 to it and you will be within a few numbers of your spot. Although our Counter hasn't moved much lately, we have been doing repairs and filling in the lost numbers. I don't have a completely corrected list yet but I have been rebuilding it from a backup list and emails from you all. ALSO we still have a HOLD on adding new names to our chiming Revere/GE clocks until we make further progress on our current waiting list. We will let you know when new names will be added. PLEASE NOTE: We will only be offering two choices of service work for your clock: this complete Restoration and the Movement/Rotor package which is everything but Case work. Ninety-nine percent of our customers want a complete service package, some with case work and some without it. We can no longer do a quick fix movement only service because of the amount of clocks waiting for full service work. The Silverdollar Productions touch given to your case would signify a finely reconditioned timepiece saved from the ravages of time! This is one area where most clockmakers don’t even want to get involved in. 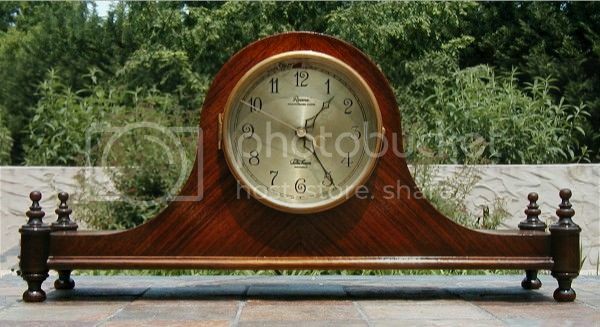 You may not notice it, but your clock has undergone a slow transition over the decades. Embedded dirt, layers of old wax, neglect and smoke damage have contributed to premature aging and drying of the wood. In addition to a full movement overhaul and a rebuilding of your rotor - see details below - we restore your entire case. The old finish on your case is removed down to the original wood. Small scratches get blended in and any minor repairs will be made. We can also do more extensive repair work at an additional charge. Then, after a week of hand rubbing in coats of tung oil, the finish is brought back to a beautiful luster revealing the lovely wood your clock was made with. In addition, all brass fixtures get cleaned or repainted if that was the original finish. Dials, hands and glass are also cleaned. 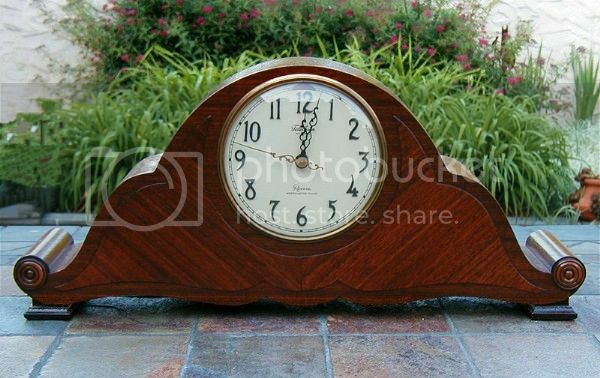 What you will get back is a beautiful clock ready to offer you many years of faithful service. Please note that although we do everything to make your case look as good as possible, there may still be signs of wear from aging. All work is done the old fashioned way! We only use the finest Formby's Tung Oil Finish, hand rubbing it on and into the wood of your case with light sanding between coats to ensure a beautifully smooth and brilliant finish. All Clock Restorations come with our set-up and unpacking guide. Full email and phone support at no extra charge. Additional labor for repairs or adjustments are billed at $50/Hr. Must minclude rebuilding of rotor. Most of the clocks we see haven't had regular service done on the movement over the years, and some have never been serviced. Service work will clean up the dirt and grime that has built up, make your clock run better, clear up many minor problems, and extend the life of the movement. If your case is in good condition, or you are happy with they way it looks, we can service and repair the rest of your clock. We remove your movement from the case, remove the coil and rotor assembly, disassemble part of themovement, and sonic clean the movement in our industrial ultrasonic cleaner. Once cleaned, we inspect the entire movement, including the coil and rotor and the electrical wiring, and make all necessary adjustments for the chimes and strike. We replace certain tension springs and properly oil your movement. The movement is then bench tested for up to one week, and any adjustments are made during this time. Once we feel the movement is operating correctly, we reinstall it in your clock case, and install a new reproduction cloth covered power cord with a button type plug. We clean your dial, hands, glass and the basic case. All brass is cleaned and the clock is tested one more time before it is returned to you. If you are not sure about the age or condition of your rotor, we strongly recommend having it rebuilt at this time. There is no way of telling how long a rotor will last, even if it does fine during our week long testing. If your original rotor does fail within our warranty period (4 months), we will rebuild it without any additional labor charges - you only pay for the rebuilding but will be responsible for shipping charges. After that time, there will also be additional labor charges. Price does not include additional parts such as glass, chime rods, etc. nor case work. Even if we are only servicing your movement, we will need your entire clock to ensure proper adjustment and calibration of your clock. We can not accept the movement only since we have no control over the reinstallation of the movement, dial, hands, etc. and would not be able to warranty any service work we have done. Additional labor for repairs or major adjustments are billed at $50/Hr. The rotor is the most important part of your Telechron movement. Along with the field coil, it runs your movement. It is, in itself, a tiny movement consisting of plates and gears. It was sealed at the factory when your clock was new, and it may still be running. A bad rotor can cause a multitude of problems from slowing time, making noise, and chiming out of synch. Remember, most of these rotors are from the 1930s or 1940s, which makes them 70 - 80 years old. Unless they have been replaced or correctly serviced at some point since they were new, you should have your rotor rebuilt. Unfortunately new rotors are no longer available, and a used rotor is, well, a used rotor. There have been many tricks along the way to inject oil into your rotor or drill a hole and add oil, or even replace it with a new one piece motor assembly. We have tried them all, and have not been satisfied with any of these approaches. We feel the only way to correctly service a bad rotor, is to take it apart, clean it, replace any worn gears, fill it with new synthetic oil, seal it back up and set it to the Original Telechron Factory Specs. We can guarantee this works and you can be worry free for years to come. Price does not include a core charge if you do not have a good used rotor core. HAMMER TIPS: Your clock was fitted with hardened leather tips on the strike hammers at the factory. Over the years these tips can wear out, get brittle, or break off. We are able to refit your hammers with new hand cut hardened leather tips for that "like-new sound". CHIME RODS: Your clock came with a tuned set of four or five chime rods depending on the model. The original rods were made of steel and were affixed to a metal chime block. This block was attached to the bottom of the case (in most models), which acts as the soundboard (for resonance). Over the years the rods can become brittle and break, or go 'dead' and make a 'thud' sound. They are extremely delicate and must be protected during shipment. If you have a broken rod(s) we can usually make a replacement rod of steel to match your set, and tune it to your set. We also have new copper rod sets available should you need the entire set or if your set is missing or broken. Please note that we can also make up custom sets for Dual Chime clocks that are tuned to play both the Westminster and the Canterbury melodies. GLASS: Almost all Revere and GE clocks have a round or oval convex glass lens over the dial. You just can't hit the Home Depot or Ace Hardware and pick a replacement up if yours is broken, clouded up, or missing. We can supply new replacement glass or in some cases original used lenses. Some clocks require custom made glass to allow for greater depth, or to properly fit your bezel. We can provide glass in almost any size and shape for just about any application. We can also provide flat glass in any shape. REAR DOORS: Early clocks used a Bakelite cover or door on the back opening. These were mounted on a series of pins and cut outs were added for various knobs and levers. Many times these covers are missing or cracked. We are able to make new cover doors from new material that will match your original door and many times we can supply a reproduction instruction label that matches the original that was on the door. We also routinely repair the hinges on hinged doors. MISCELLANEOUS PARTS: We work on Telechron Motored Clocks - only! Over the years we have aquirred a supply of various parts for many models and movements. We can usually find the part you might need to replace a broken part on your clock. This includes many movement parts, field coils, decorative pieces, and case parts. Bezels, hands, and dials are just a few of the parts we may have. We can also machine brass and metal parts as needed. MISCELLANEOUS SERVICE: Over the years we have developed working relationships with many other vendors and craftsmen that can supply us with special requests. Like the custom glass mentioned above, we can have dials resilvered and rescreened, custom wood carvings done, and hand painting on dials and cases. If we can't do it in our shops, we usually have someone who can do it to our specifications. Please understand that parts for Reveres, Telechron, and GE clocks may be in short supply, or very difficult to come buy. Our parts supplies are reserved for our customers having their clocks repaired or restored. Because of this, we regret the fact that we cannot sell any of the parts mentioned on these pages on an individual basis. We warranty our Repair Services for Four months with no charge for labor or any parts purchased during service work. You will be responsible for all shipping charges unless there is an insurance claim issue for damages. Rotors are warranteed for Nine months Parts and Labor (shipping is additional). Adjusting the time and setting the chime rod hammers are demonstrated in videos on our web site and you are responsible for this once you receive your clock back. We will assist by email and/or phone if needed. We cannot cover return shipping charges for new problems that may arise nor if a returned clock is deemed to be not covered under warranty. In some cases we have issued a prepaid return label for your convenience, but if it is determined that the work is not covered under warranty, you will be charged back for the shipping charges. All repairs require a $75 deposit check or MO to be sent to our main office in Florida at the same time as the clock is sent to one of our repair shops. Upon completion, your final invoice will be credited with this deposit. We will advise you of any additional costs other than what has been indicated on your order form, and will wait your approval before proceding. Invoices are due on receipt when your clock is completed and ready to ship back to you.You may pay by personal check, Money Order, or PayPal using a credit card or eCheck. Unless prior arrangements have been made, clocks left unpaid over thirty (30) days, may be sold to pay your invoice. By sending in your clock and order form, you are agreeing to the terms as described here. this webpage is printed on 100% recycled paper. website and contents ©2000-2015 Silverdollar Productions, Inc.